Across the board wild foods are more nutritious than their cultivated counterparts. What allows wild foods to survive and thrive without human intervention is also what makes them more flavorful. Wild foods are more nutrient dense. Who doesn’t need more nutrient dense foods in their diet? 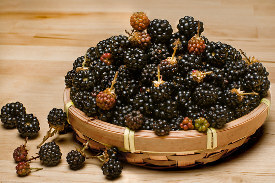 Like most berries, blackberries, wild or cultivated, are loaded with health promoting nutrients. Those nutrients provide the following health benefits. Warning: blackberry seeds are big and tough and like to get stuck in your teeth. However, they’re very nutritious so either chew or swallow them whole. This smoothie wasn’t very thick and creamy like I usually make them. Add avocado or banana to thicken if you’d like. Enjoy! Please leave a comment below if you try this wild blackberry smoothie and let me know how you liked it. Happy Blending! hello ryan, I have come across your site I am in the uk, I am searching for food recipes for my poor husband who has had a attack of diverticula. This is all new to us and all the info is so confusing, so I have introduced smoothies for breakfast to try and get fruit fibre etc into his diet. I am using almond milk at the moment, berries and bananas which is going down ok. I have brought the book, wow so many pages to download lol, still need to get him back to health hes so un happy at the moment. Do you have any suggestions smoothie wise for ibs and or diverticulis? Any help would be so much appreciated.